The second study  focused on 224 overweight and obese adolescents, who consumed up to two sugary drinks every day, yielded a similar result. Here, the intervention group received a delivery of bottled water and diet drinks to discourage sugary beverages in the home, which is where most of these products are consumed. The control group simply continued on the same path. After one year, teenagers in the sugar-free intervention group gained less weight. This was particularly true with Hispanic teenagers. It may soon be possible to calculate your own obesity risk based on the genes you carry, enabling you to consider adjusting your diet accordingly. This personalized approach is just one feature of a rapidly evolving science called nutrigenomics. Yes, this is another one of those “omics” fields, there are lots of them popping up! The NEJM findings support New York City’s courageous but controversial move to ban supersized drinks, and the American Medical Association’s proposal to impose a “soda tax” to discourage consumption. Tough strategies have worked for tobacco, and many would argue that similar steps are needed for sugary soda, because for some groups in the U.S. these beverages account for 15% of their daily calories. 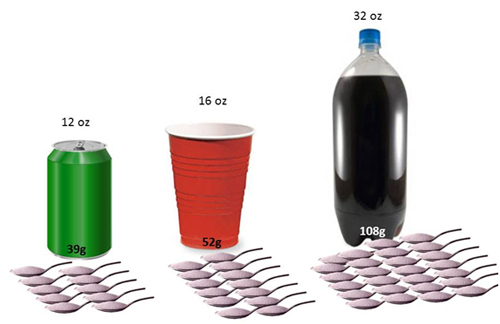 Adolescent boys, for example, down about 357 calories worth of these drinks each day, and sugar-sweetened beverages are the largest source of calories for children between 2 and 18 years old. Plus there’s evidence that drinking these beverages doesn’t suppress the appetite, so these may truly be just extra, empty calories. It’s no secret that obesity has reached epic and epidemic proportions in the US; two thirds of adults and one third of children are obese or overweight. (See: A VIEW OF THE U.S. OBESITY EPIDEMIC). And, the consequences go well beyond appearance. Obesity raises the risk of type 2 diabetes, heart disease, fatty liver disease, and some cancers—the list goes on. If we don’t come to grips with this growing epidemic, this may be the first time in U.S. history where children will have a shorter life expectancy than their parents. Americans spend more than $60 billion on weight loss schemes and products each year. These recent papers suggest that one strategy that might help us all is to cut out these sugary drinks (and, sadly, most fruit juices aren’t much better)—these beverages don’t curb your appetite and only add calories. This decision just might be the easiest, not to mention cheapest, part of any plan to achieve and maintain a healthy weight. de Ruyter JC, et al. N Engl J Med. 2012 Oct 11;367(15):1397-406. Ebbeling CB, et al. N Engl J Med. 2012 Oct 11;367(15):1407-16. Sugar-sweetened beverages and genetic risk of obesity. Qi Q, et al. N Engl J Med. 2012 Oct 11;367(15):1387-96.